I skipped my lunch run due to rain, to help a co-worker drop her car off for service and to get Pho Soup...WEAK I know... but don't judge. When I got home I knew I needed to get in a few miles. Thankfully hubby was game and the Little Studs love the jogger and going to the Track. It is pretty funny to hear boys ages 3 and 5 beg to go to the Track, we have trained them right!! The High School Track was busy with little-people soccer...BUMMER!! We cut across to the muddy Junior High Track. I put one earbud in and hit play.. Funny timing because "Barking at the Moon" HERE from the BOLT Soundtrack came on, a song I added for the Little Studs during the Marathon. This song reminded me to be in the moment. Little Stud #1 was stride for stride with me, he is becoming quite the little runner. The boys got bored and headed to the Tennis Court and I continued, waving each lap. I tried to kick up the pace but my lungs did not like the cool evening air. I did a few more laps and headed back to the family. 3.5 miles is better than nothing. I look forward to not being in Marathon training so I can ENJOY these nights with no (self-induced) guilt about pace or mileage. After texting Tammy and Janna I had a morning run buddy!! YIPPEE. It was cold I did not want to leave my car. The plan was 5 miles at Goal Pace but the HILLS in Falling Water are pretty tough, we kept the pace as best we could. So NICE to see Janna, we have not been able to run together in ages. It was funny she kept dropping pieces of her gear all over the neighborhood, gloves by the light pole, hat by the stop sign, and coat on the street corner...it was like an Easter Egg Hunt when we wrapped up. I only had time for 5 miles, so we chatted briefly about Boston and I was off to get ready for my Big Girl Job. My planned 8 miles for Thursday was done in 2 runs and I am HAPPY with that :) The important part about a training plan is allowing yourself some flexibility. Middle of the night Little Stud#2 screamed out, not sure how but I wrenched my neck and totally tweaked it.. UGH!! I get this now and then (Probably an old Basketball injury) where there is pain when I turn my head, I call it Batman neck. Usually it takes about 3 days to pass, I sure hope it does this time.. If not I will be turning my whole body to see on race day. Tomorrow is my last Long Run of Marathon training and I am EXCITED!! I cant wait for my victory lap in Beantown. Not judging! Sometimes there is other stuff to be done. Awesome that you were able to hit the track for some family activity time. Nice job on the EARLY run too!! That's what we momma's do...juggle our training schedule! It is a talent in itself! I've got my last 20-miler this weekend before Eugene. I'm pretty excited! Then 16, 8 and the real deal! Third... I hate when I get tweaked in my neck. Poor Tall Husband a glass of wine and beg him to give you a littler massage. Fourth... weekend, well I was hoping for another Brick... my first Tri is a week from Sunday, but the weather isn't going to cooperate. I may do a swim run instead... Other than that, not much! I pray my children will beg me to go to the track someday! You certainly have raised those kids well! Kids who beg to go to the track and run? !, who knew they existed! Bummer about the Batman Neck, but awesome name for it. Even if you run with it, it sure won't sound like a hindrance! I can't believe it is so close to boston. it is going to be so exciting. your training has been great to follow. my weekend plans include a run tomorrow with my good friend, 5 miles and then a 10K on Sunday. It seems getting back into the swing of things is taking forever, but i know i will get there! YAY! Last long run until Boston! What a good feeling! So proud of you Mel! Good for you for getting up early for a run! I was wide awake at 5am this morning and almost got up for an impromptu run, but fell back to sleep! Enjoy your last long run of training! Good luck with your last long run pre-Boston! :) And I hope your neck is feeling better soon. I hope your neck feels better. And yay for squeezing in the miles. I can't wait to hear how Boston goes. 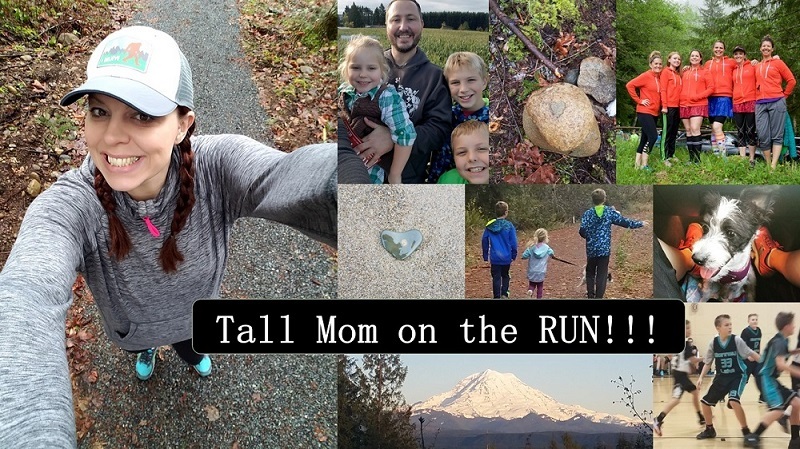 This weekend I have a 5K I am running over in Seattle. Good job fitting in your run!! Sorry about your neck. Hope it feels better soon. Tomorrow the hubby and I will go for a 6 mile run and then we are taking a much needed family fun day!! Maybe I should try taking my kiddos to the track! My weekend plans - 10 mile run on Sat, followed by soccer for the kids, followed by a wedding shower, then a high school reunion..Sunday I am going to cheer on my friends who are doing a HIM! I have my last 32km/20mi run before taper starts! Hard to believe I'll run marathon #2 in just over 3 weeks. Ah! Hope your neck is okay!! Hit some 3's and it will be better hoop stud! Enjoy your long run tomorrow and visualize yourself taking it all in in Bawwwwhston!! In 2 weeks, running becomes that joyful outlet it started as!! Go MEL!